REDONDO BEACH, Calif., April 24, 2012 -- Northrop Grumman Corp. (NYSE:NOC) and its teammate ATK (NYSE:ATK) have completed the construction of the center section of the primary mirror backplane support structure (PMBSS) for NASA's James Webb Space Telescope, an important milestone in the telescope's hardware development. Northrop Grumman is under contract to NASA's Goddard Space Flight Center in Greenbelt, Md. for the design and development of Webb's sunshield, telescope and spacecraft. The PMBSS will support the telescope's beryllium mirrors, instruments, thermal control systems and other elements during ground tests, launch, and most importantly during science operations. The PMBSS holds the 18-segment, 21-foot-diameter primary mirror nearly motionless while the telescope is peering into deep space. The center section backplane is the first completed flight subassembly of the PMBSS and is several months ahead of the current baseline schedule. "We are pleased to have completed the first major structure of real flight hardware for the Webb's primary mirror backplane," said David Shanahan, vice president and general manager, Space Structures & Components, ATK Aerospace Systems Group. "With every milestone, we bring the Webb telescope one step closer to making discoveries that will revolutionize astronomy." 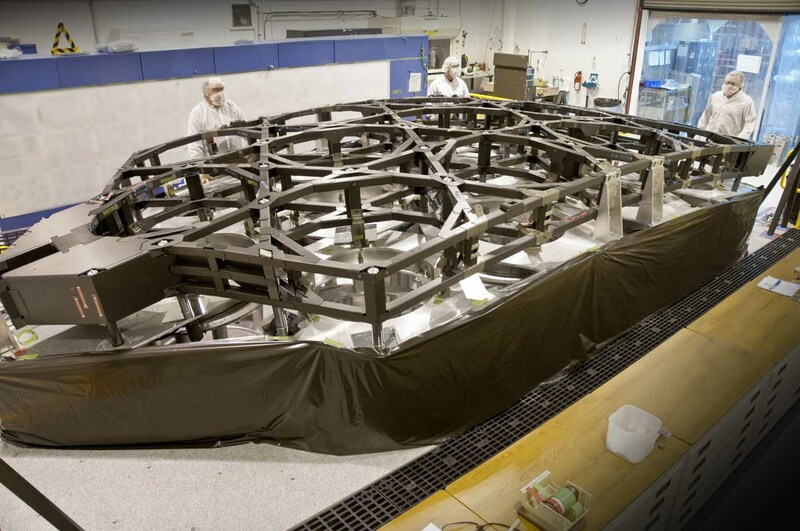 Measuring approximately 24 by 12 feet and weighing over 500 pounds, the center section of the 2,200-pound primary mirror backplane must meet unprecedented thermal stability requirements. The PMBSS holds the alignment of the telescope's optics through the rigors of launch and over a wide range of operating temperatures, which reach as cold as -406 degrees Fahrenheit. During science operations, the backplane keeps the 18 primary mirror segments in place with stunning accuracy, forming the single, pristine shape of Webb's primary mirror. For example, if the mirror were enlarged to span from Los Angeles to New York City, the stable alignment of the PMBSS would be accurate to less than one inch. The center section backplane of Webb's PMBSS was designed, constructed and tested at ATK facilities in Magna, Utah. ATK manufactured 1,781 composite parts of the center section using lightweight graphite materials and advanced manufacturing techniques. The composite parts were assembled along with 179 metallic fittings that provide precision tolerance interfaces for the other elements of Webb. ATK is an aerospace, defense, and commercial products company with operations in 22 states, Puerto Rico, and internationally, and revenues of approximately $4.8 billion. News and information can be found on the Internet at www.atk.com .